Released in 2009 #10193 Medieval Market Village is an absolutely gorgeous set – and it’s the perfect set to add a bit of ‘olde world charm’ to a town layout. 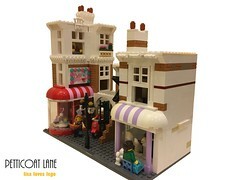 Realistically towns and cities evolve, new blends with old, so why should a Lego town be any different? 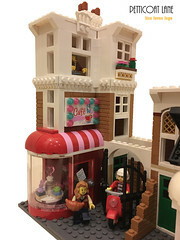 I’ve included the set along with #10199 Winter Toy Shop, on a 48 x 48 baseplate – to become a sort of cultural quarter in my town layout. I’ve make some small changes to the buildings – giving the Toy Shop a brown tiled roof, and adding some doors to the blacksmiths which has now become a restaurant. This video will give you a better view of what’s going on! You’ll also notice I’ve mixed both the buildings from #6094 Guarded Treasure together to create a sort of castle type tourist attraction. 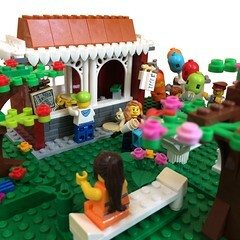 And if you look really closely the the tavern you’ll see the damage that sunlight can do to Lego! 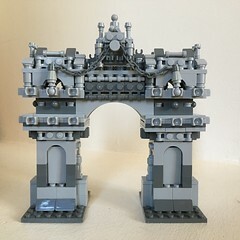 I’m in the middle of moving my Lego layout to another room, but I can’t wait to integrate this into my town layout! Pictures will follow as soon as that happens!